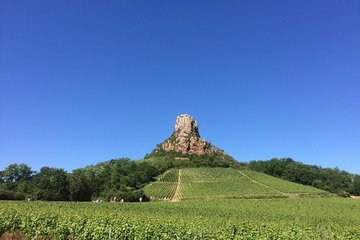 It would be a crime for wine enthusiasts to leave the Auvergne-Rhône-Alpes region of France without enjoying a winery or two. Spend a full day tasting the area’s top Macon and Beaujolais reds and whites on an 8-hour tour from Lyon. Delight in 11-12 wines, including Pouilly Fuissé, Pouilly Vinzelles, and Brouilly. With maximum eight people per group, you’re guaranteed to have an intimate, authentic, and immersive experience. Air Conditioned minibus - very confortable. Wine tasting with about 11/12 wines tasted. The Meeting Point for Tour departure is the building of Lyon Office de Tourisme located on Bellecour Square (50 metres in front of Le Royal Hotel). Customers must join the Meeting Point 10 minutes before tour departure that is at 8:50 am. To access Bellecour Square, you can take Metro Line A or D - Station Place Bellecour or a Bus.